" Now come on. Tell me, did you or didn't you ride my motorcycle off the bedside table ?" This took Ralph by surprise. He had not expected the boy to guess what happened.
" Well, yes. I guess you might say I did," confessed Ralph, rubbing his aching muscles. "I thought so," neither the mouse nor the boy was the least bit surprised that each could understand the other. Two creatures who shared a love for motorcycles naturally spoke the same language. This marked the beginning of a wonderful friendship between an adventurous mouse named Ralph and a boy named Keith. They met when Keith and his family decided to stay in an old motel in the California foothills for a vacation. Ralph's family ( mother and siblings) and extended family ( countless Uncles and Aunts) lived in the mouse holes and knot holes of this motel and survived on the crumbs guest left in their rooms. Ralph was not an average mouse,nervous and scared. Per his worried mother, he was ' a reckless mouse' who loved to stay out late in the daytime when he should be sleeping safely at home. 'Pb-bb-bb' 'Pb-bb-bb' that's how you start a toy motorcycle, Keith taught Ralph. The little mouse went zooming around in the motel. The story is a very engaging one. 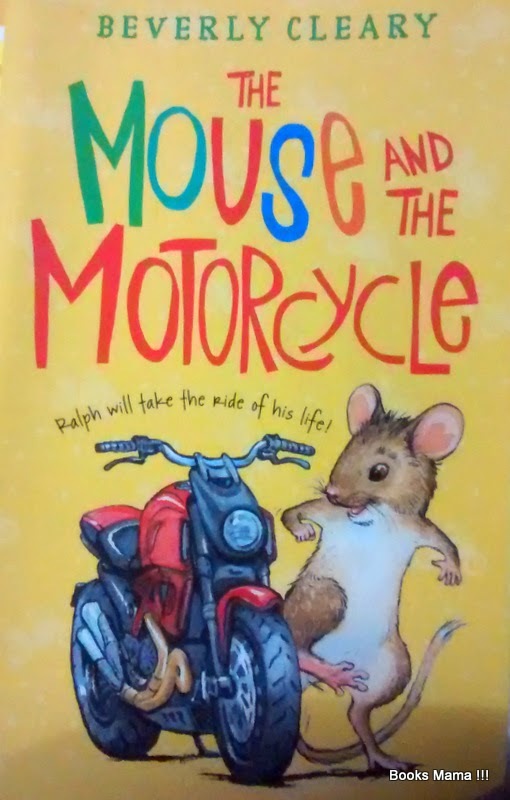 Readers will love to roam the corridors of the motel along with Ralph.At times, it also takes readers to mouse world where a mouse house is furnished with a clutter of things - bits of Kleenex, hair and raveling people drop on the motel floor. The story has it's share of climax too. Ralph like a real hero, saves himself from near death situation when he lands up in a laundry pile. He like a true friend, risks his and his families life to help his friend Keith. As a Mom, I loved what Keith had to say when Ralph asked him if he was mad at him for losing the motorcycle. "I guess you might say I'm mad but not real mad,"Keith decided. " I've been lying here thinking. It wouldn't be right for me to be real mad, because I get into messes myself. My mom and dad tell me I don't stop to use my head." Wow ! it takes courage to own up that even we make similar mistakes and therefore, be kind to the offender. A enjoyable read for readers aged 7 and above. Paper back, 184 pages.